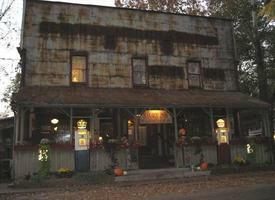 If you are seeking out haunted places in Indiana, then you should consider visiting the Story Inn. Located on South State Road in the city of Nashville, Indiana, this particular structure has been considered one of the most haunted places in the area. Officially known as the "Oldest Country Inn" located throughout the State of Indiana, this structure is located at the middle point of the State Park known as "Brown County" and the National Forest identified as "Hoosier". This particular inn acted as an entire town in itself initially, so it is no wonder that it has had countless reports of paranormal activity. When it comes to haunted places in Indiana, the Story Inn is quite intriguing. The area where the Story Inn is located initiated as a community for logging in the year of 1851. As you approach the structure, you will discover a general store that once serviced the residents and visitors of the area. Today, the area where the general store was located; there is a restaurant that serves gourmet style food. In the front of the building, you will discover old fashioned gas pumps installed by the "Gold and Red Crown" company. If you travel into the basement area of the Story Inn, you will find a pub that services individuals in the neighborhood as well as those that visit this haunted location. While there are other buildings in the community such as a sawmill, they are not considered to be haunted places. When the current owner took possession of the inn, he had heard the stories surrounding the hauntings of the structure but was a skeptic. When he acquired ownership of the inn, he noticed that there were guest books located throughout each room. He sat down and examined the contents of each room and was surprised to see that every single book contained documentation of paranormal activity. The book that was located in the room right above the area of the restaurant in the inn had the most documentation surrounding stories involving ghosts and other types of strange phenomenon. Throughout the history of the Story Inn, these guest books have always been included in the rooms. Once they reached their maximum capacity, the employees of the inn would place them in the attic area. The owner discovered these books and found that the guests had been leaving accounts of ghosts and strange phenomenon throughout most of the history of the structure. The most common account relates to a spirit known as the "Blue Lady". It is believed that this spirit of the wife of a man who was named Dr. George Story in life. The room that is noted for having sightings of this ghost was once called the "Garden Room" and is located above the restaurant in the inn. Today, it has been renamed after this spirit. It is believed that if a blue light is placed in the "on" position in this room that the spirit will show up. However, there have been numerous instances in which this spirit simply appeared on her own, without the assistance of the supposed "summoning" light. People that have experienced this being state that she has eyes that are hypnotic blue, that she leaves behind items that are blue in color such as ribbons, and sometimes she appears to acknowledge the living and other times she tends to business within the room without acknowledging the living. Many individuals even claim to smell cherry tobacco - which is what many believe the "Blue Lady" smoked during her lifetime. In the year of 2005, a paranormal group identified as "Hoosier Paranormal" gained an interest in the haunted places in Indiana and set up research at the Story Inn. This happened on the 27th day of December that year. The group gathered their evidence and established that there did, in fact, seem to be the ghost of the "Blue Lady" as well as another spirit that seemed to be a male. If you are in the area, and have an avid interest in haunted places in Indiana, the Story Inn is a wonderful place to visit. Get the directions, view photos, and read the reviews and traveler tips for the Story Inn.